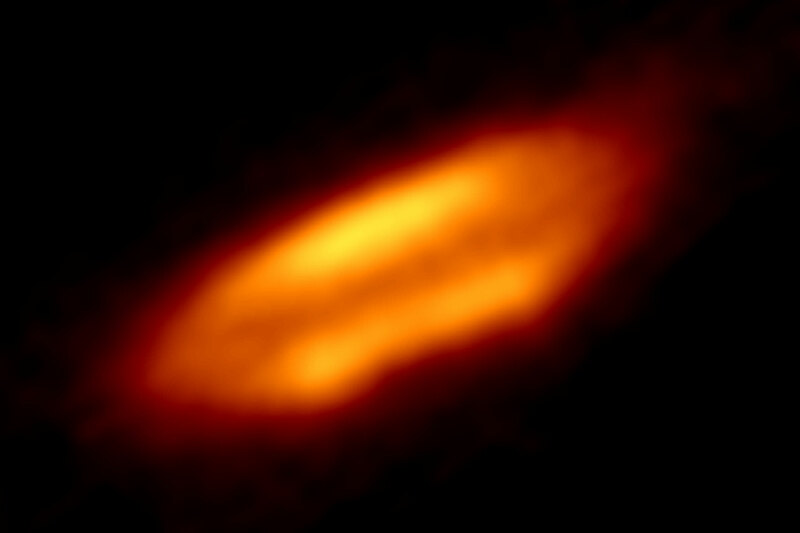 This newly released ALMA image shows a newborn star enshrouded in dust. This intriguing image may look like a collection of colored blobs, but it is actually a high-resolution snapshot of a newborn star enshrouded in dust. Located 1300 light-years away in the Orion Nebula, the star, named HH 212, is remarkably young. The average lifespan of such a low-mass star is around 100 billion years, but this star is only 40,000 years old — truly an infant in stellar terms. In the cores of the vast molecular clouds in star formation regions, an ongoing battle rages; gravity versus the pressure of gas and dust. If gravity wins, it forces the gas and dust to collapse into a hot dense core that eventually ignites — forming a protostar. All the leftover gas and dust form a spinning disc around this baby star, and in many star systems they eventually coalesce to make planets. Such very young protostellar discs have been hard to image because of their relatively small size, but now the exceedingly high resolution of the Atacama Large Millimeter/submillimeter Array (ALMA) makes it possible to understand the intricate details of star and planet formation. A closer look at HH 212 reveals a prominent, cool, dark dust lane running through the disc, sandwiched between two brighter regions that are heated by the protostar. The result resembles a cosmic “hamburger”. This is the very first time astronomers have spotted such a dust lane in the earliest phases of star formation, and so it may provide clues as to how planetary systems are born. Credit: ALMA (ESO/NAOJ/NRAO)/ Lee et al. Be the first to comment on "ALMA Views a Newborn Star Enshrouded in Dust"